This is one of my favourite cake. It is fruity and moist and I love the smell of this cake. It is not too sweet and a bit tart, great for afternoon tea with a cup of tea. 1. Preheat oven to 200 degree. Line a loaf pan with parchment paper. 2.Mix dry ingredients - flour, baking powder, baking soda, and salt in a bowl and set aside. 3. Beat butter and 90g sugar with an electric mixer at medium-high speed until pale and fluffy for about 2 minutes. By hand with a balloon whisk will take about 5 minutes. Add vanilla extract and eggs and beat well to combine. Add sour cream and beat well to combine. 4. Add in flour mixture in 3 batches, mix until just combined. 5. Spoon batter into loaf pan, give a light tap and level the top slightly. Scatter raspberries evenly over the top and sprinkle with the remaining 1 teaspoon of sugar. 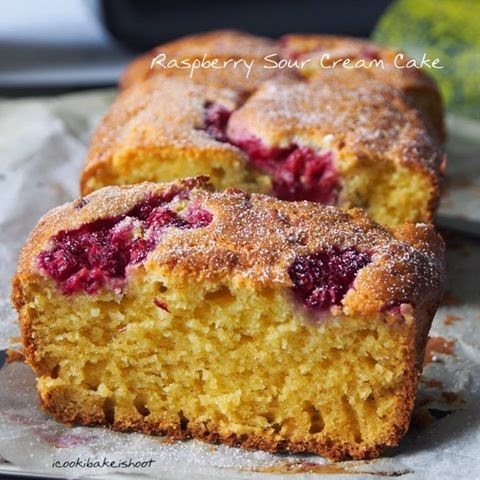 Do not push/press the raspberries into the batter as they will sink slightly during baking. Whole raspberry will sink right to the bottom, so smaller pieces are preferred. 6. Bake until cake is golden brown and a skewer comes out clean , about 25 to 35 minutes. Cool in pan for 5 minutes, then cool on a rack. Thank you Jeannie ! You are most welcome !